Peugeot is launching its first customer service channel on Twitter to improve brand advocacy. Created by EHS 4D Group, the Twitter address @PeugeotCare will be managed by the brand's outsourced contact centre The Listening Company. 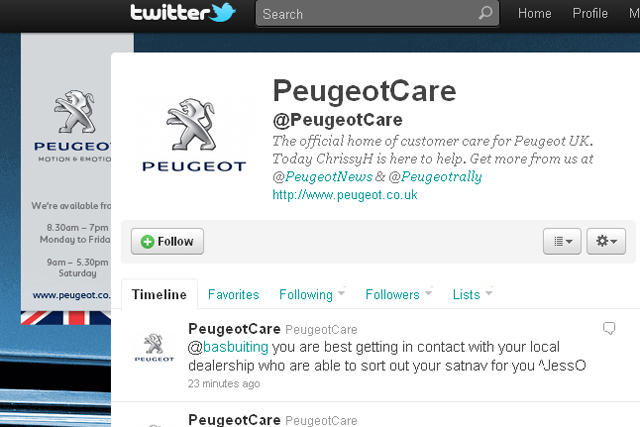 The Twitter page will support Peugeot's existing telephone and email customer response service. It will allow the car brand to link with its customers in a forum where common queries will be shared and responded to quickly. Andrew Goodall, internet manager, Peugeot UK, said: "We expect the Twitter page to serve as a vital method of tracking and managing customers’ needs – identifying common trends in queries, and ultimately helping us to improve and build on their needs in the future." David Skerrett, head of social media and mobile at EHS 4D Group, said: "The conversational platform creates transparency for the brand, allowing customers to directly engage with Peugeot in a visible and accessible environment. "It's smart for brands to include Twitter as a service channel, as more consumers expect brands to be fluent and have a presence in the social media space."